To be considered for this award, a player has to be a hard worker and willing to move quickly from attack into a defensive position. They need to be alert to the court position and likely moves of their opponents, and should be able to demonstrate fast feet (up on the balls of their feet) to provide a constant interference to opponents. They should be focused on the job of not allowing opponents to get past or to have a shot at basket. Such a player will show a hunger for the ball and should be very frustrating to play against. Past winners of this award have demonstrated a clear willingness to try to be better basketball players. Sometimes, this involves trying out something new, or working to correct a weakness. Players can also show they are developing by listening to and acting on the advice given by coaches. Potential candidates need to look at their own style of play and realise where improvements can be made. Sometimes this involves breaking old habits or having to take that first step to try something new. An award winner will have shown the greatest amount of improvement over the course of a whole season, regardless of their starting or finishing skills level. It sounds very obvious, but basketball is a team sport. You might be the top scorer for your club or team, but if you achieve that by hogging the ball and not involving the rest of your team, then your value as a team player must be considered pretty low. So, in the Broncos, the Most Valuable Player award reflects the influence a player has had on the club, team or age group over the course of a full season. A potential winner should have demonstrated a high level of skill, enthusiasm for the game, and a willingness to involve other team/club members. High standards of behaviour in training have also featured strongly in past recipients of this award, with hard work and a positive attitude being the minimum requirements which Coaches are looking for. Players’ achievements are recognised in two main ways at the club. Since the Broncos were founded in 2004, we have celebrated the qualities shown by our young people by the presentation of our annual Bronco Awards. Season 2007-08 saw the introduction of our own Bronco League and League Awards. Since then we have marked individual and team achievements based on players’ performances in the matches held over the course of the playing season. As a club, in due course we hope to be able to display a long list of team honours on this page. However, particular mention must go to a special award made by the club to the Broncos’ Rookie Girls team who had the outstanding achievement of winning all their matches, home and away, in the 2005-06 season’s Satellite Superleague. A fantastic effort! 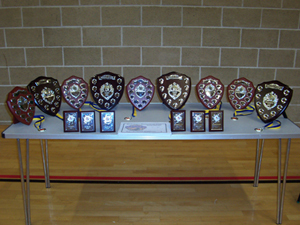 During the club’s first two seasons, the awards were split into two age groups with both girls and boys challenging for the trophies. 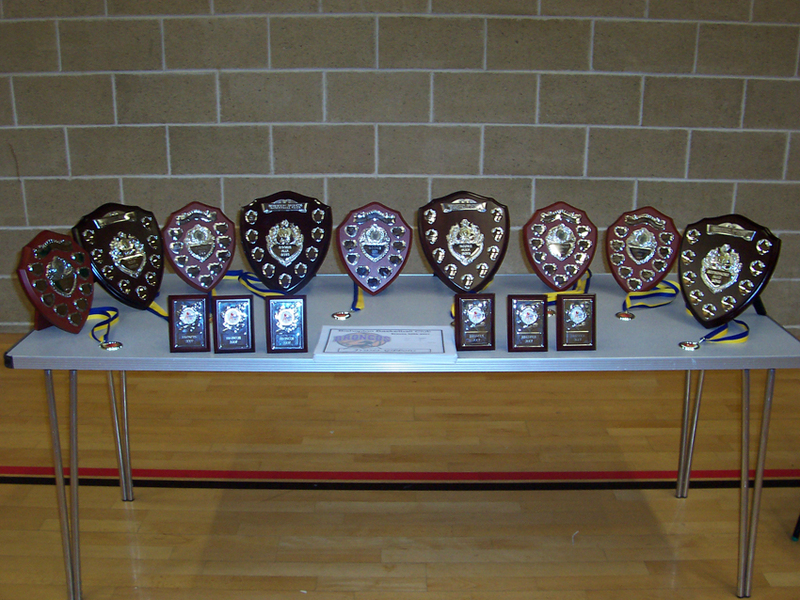 Despite a shortage of girls at sophomore level, we introduced more trophies to recognise the individual achievements of girls and boys separately, more closely reflecting the new training structure. From season 2008-09, the list of available trophies was expanded again in order to reflect the strong representation of players at all age groups in the club. At Awards Night 2010, we were privileged to be joined by Glasgow Rocks’ guard Scott Russell who presented the awards and spent a lot of time with our players. 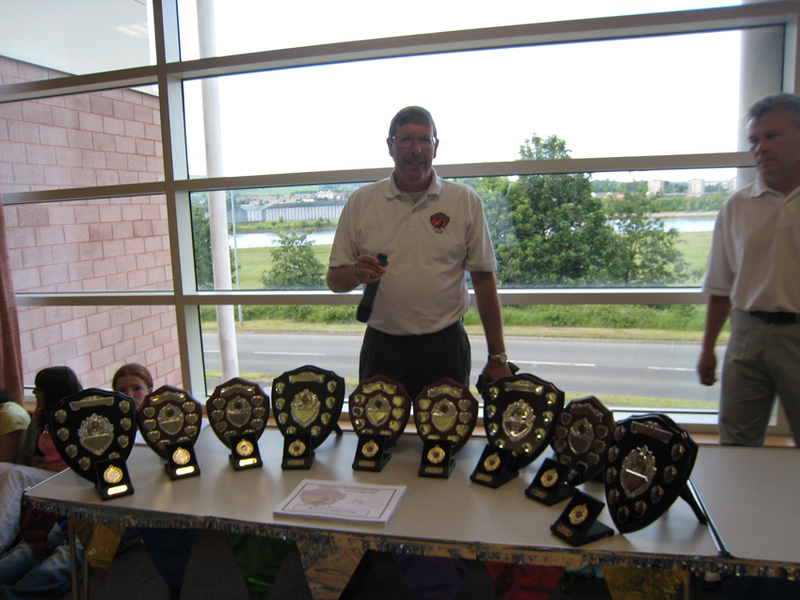 In 2008, the increased number of awards resulting from our new Bronco League structure meant that a separate event was needed in order to provide a focus for our players’ achievements. 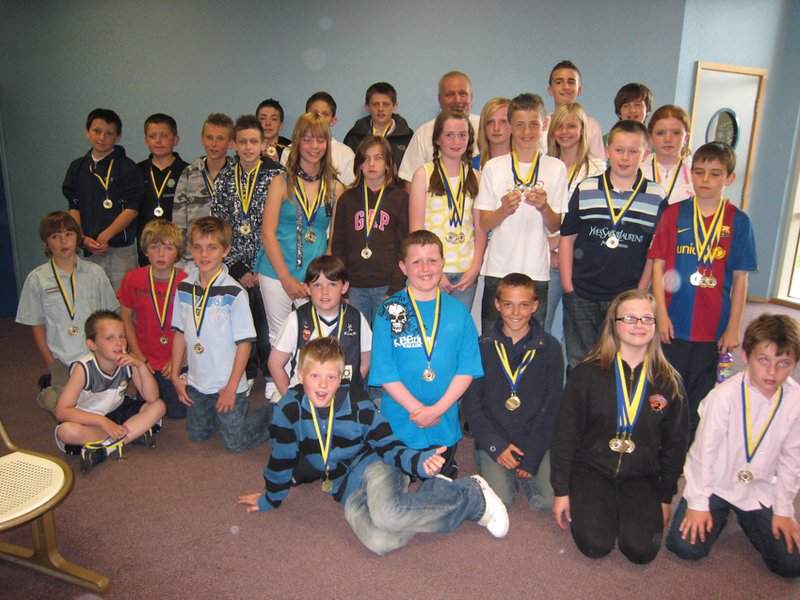 So in a breakaway from previous years’ arrangements when prizes were awarded at the end of the last training night of the season, the club crowned a successful 2007-08 when we held our first Annual Awards Night at Erskine Sports Centre on June 2008. As a result, some 130 players and family members turned up on that first night to celebrate a very busy year for the Broncos. Due to the number of children wanting to play basketball in the area, the Broncos are able to run their own league with different age groups being assigned to one of four fiercely competitive teams within the club. So there was a proud sense of achievement when the inaugural Bronco League Awards were presented by John Cameron, Depot Manager at Arriva Scotland West, who have been a great supporter of the club by providing transport at various outings such as trips to see the famous Harlem Globetrotters and the Glasgow Rocks. 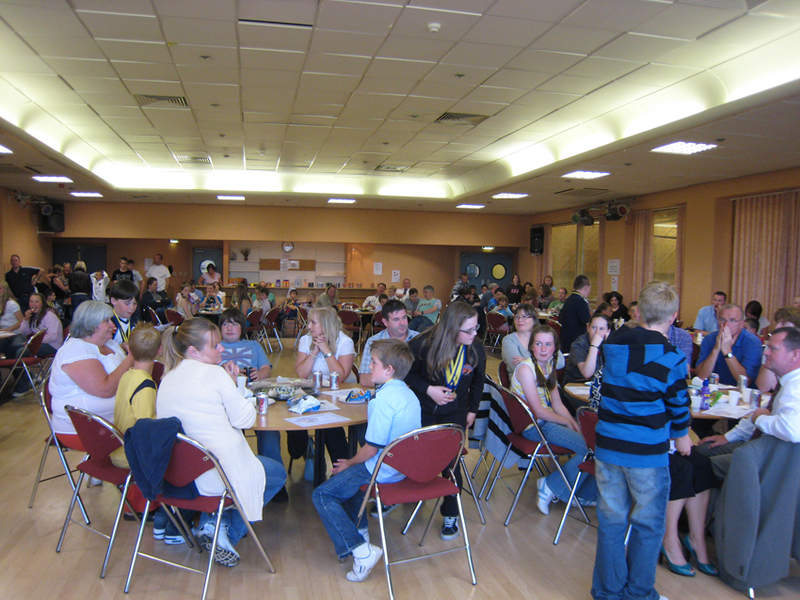 This was a really successful event which not only recognised the players’ enthusiasm for the game but also gave parents and friends the chance to get together and talk about their shared interest in the Broncos and to talk to coaches and committee members about their children and various issues surrounding the Club. For our first year of running our internal league, we split the season into separate winter and summer conferences. At Primary level, the Winter League was won by the Colts, with the Blazers picking up the Summer League award. Colts continued their success when their Rookie Girls took both winter and summer titles. However, the Mustangs’ Rookie Boys were able to match that impressive achievement. Finally, at Sophomore Boys level, the Mustangs took the spoils in the Winter League, with the Colts topping off a successful year by claiming the summer title. 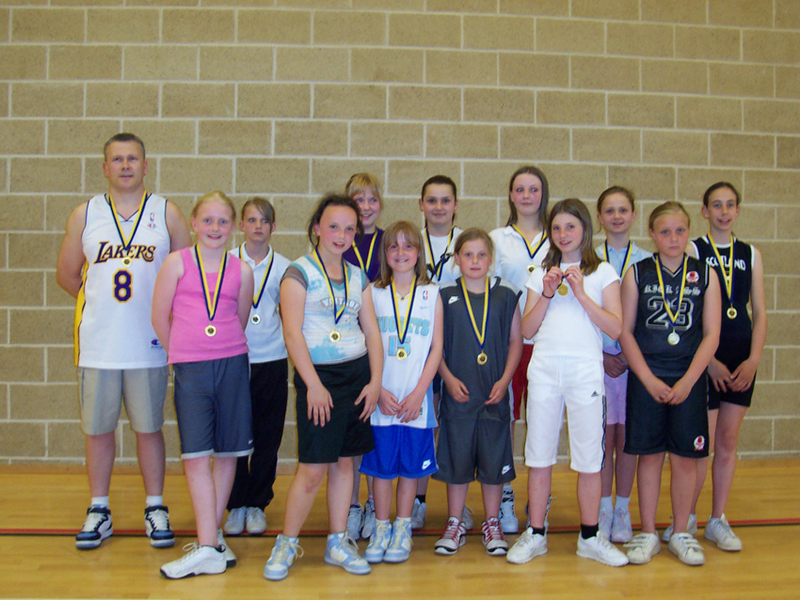 Due to renovations at the Sports Centre in June 2009, we were unable to repeat the 2008 Annual Awards Night event and had to revert to the presentations being made after the last training night of the season. Also, as a result of introducing longer, but fewer matches, the league awards reflected team performances over the whole season instead of separate winter and summer conferences. The title of Primary League Champions went to the Colts. The Chargers picked up their first league award by claiming the Rookie title while the Mustangs celebrated their impressive season with the capture of the Sophomore trophy. A return to the Annual Awards Night format with a capacity turnout allowed us to properly mark our players’ achievements throughout the year. We were privileged to be joined by Glasgow Rocks’ guard Scott Russell who presented the awards and spent a lot of time with our players. The evening also included a much praised photographic reflection on the club’s 6 years in the community. In relation to team successes, the Primary League was won by the Chargers with the Blazers picking up the Rookie title. Top slot for the Sophomores went to the Mustangs who, like all the winning teams this year, won all of the matches they played. Primary and Rookie leagues four internal club teams were boosted by the appearance of the Bulldogs from Barsail Primary School. At Sophomore level, Johnstone High School supplied two teams (Spurs and Mavericks) to result in a 6-team league. A study of the league tables will give some indication of how close some of these games were but the scores alone can’t convey the court-side excitement of the heart-pounding, nail biting, final seconds of closely-fought matches where the lead was changing every few seconds. When everything was counted up, the Primary title went to the Chargers. The Mustangs were the Rookie champions and the Blazers took the Sophomore trophy. However, most noticeable throughout the league season was the steady improvement of the Bulldogs and the enthusiastic spirit of the Spurs and Mavericks teams which really enhanced this season’s league programme.